Expanding on last year's device, Samsung's new Galaxy K zoom sports a more powerful 20.7 megapixel camera and comes with a special alarm to help users take timed selfies. Like its predecessor, the new Galaxy K zoom is hybrid device, melding an Android smartphone with the bigger lens of point-and-shoot camera. The handset has a camera with a 10x optical zoom in the back, using a 20.7 megapixel backside illuminated CMOS sensor for better low-light picture taking. Auto focus functions, filter settings, and object tracking are among the additional features built into the device, along with a so-called "Selfie Alarm". The Galaxy K also comes with a front-facing 2 megapixel camera. In terms of video shooting, the phone can record at a 1920 by 1080 pixel resolution at 60p. Outside of its camera functions, the Galaxy K has a similar look to Samsung's latest flagship phone the Galaxy S5, and has a textured back. The Galaxy K, however, has a smaller display at 4.8-inch, with a pixel resolution at only 1280 by 720. The phone doesn't have the fingerprint sensor found in Galaxy S5, but does feature the same "Ultra Power Saving Mode" to help prolong battery life. Inside the handset is a Samsung "hexacore" chip that uses both a 1.3 GHz quad-core and 1.7 GHz dual-core processors. The phone has 2GB of RAM, and only 8GB of memory, but a microSD slot for expandable storage. As a hybrid device, the phone still retains much of the thickness of last year's Galaxy S4 Zoom, bulging at 20.2 mm. But the phone weighs 8 grams less at 200 grams. 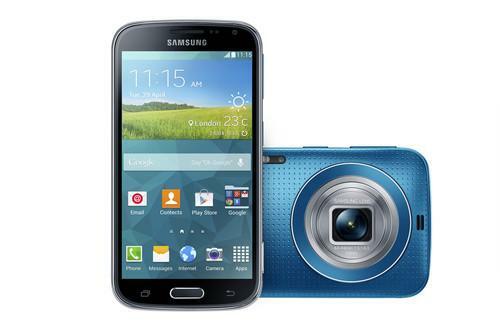 Samsung did not say when the Galaxy K zoom will arrive for sale, or for what price. The company could not be immediately reached for comment.